As part of our series in celebrating female NFL fans across the UK, I’d like to introduce you to Lucy Huskinson. 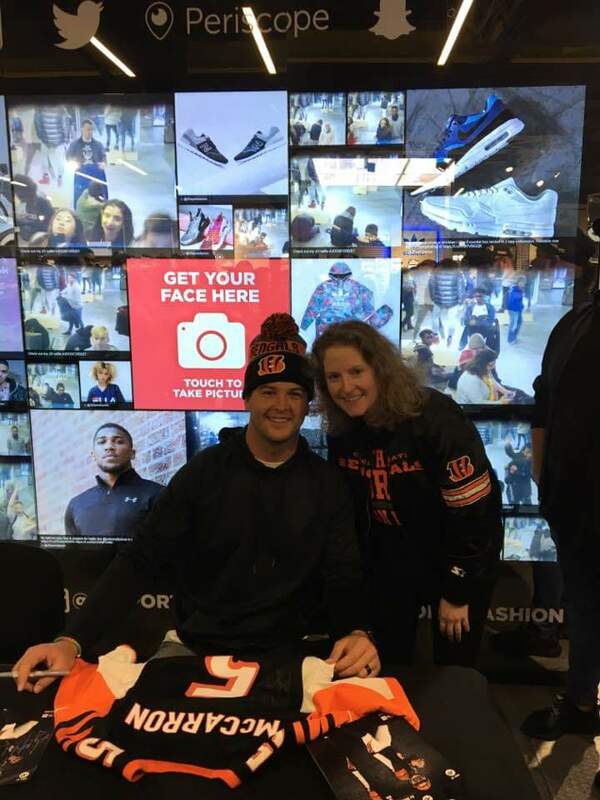 Lucy is a Bengals fan shares with us how she got in to the NFL, how she made the choice of her team as well as more about her overall experience as a fan. I’m a University lecturer of Philosophy, and I’ve been a Bengals fan for as long as I can remember. As an academic I don’t get much time to discuss the important, existential matters of life – which is ironic, given I’m a philosopher by profession. The closest I’ve got to the truth is a slogan I used to wear on a T-shirt in the early 1990s: “Football is life and the rest is mere detail”. I gave up asking American academics I meet at international conferences if they’re football fans, because invariably they’re not – I guess they’ve been duped into thinking they have more important ideas and theories to discuss! Add to that the fact that I’m an obsessive Bengals’ fan who lives in a fairly remote part of the UK (Anglesey – an island between the main land of Wales and the Irish sea) and you might begin to appreciate it’s a bit of an isolated life being so passionate a Bengals fan in my situation (or, arguably, in any given situation). To put it in perspective, I once ran up to a guy wearing an Ochocinco jersey at the end of a pier in a local town on winter’s day. I was beaming with joy as I approached him. In hindsight, he must have thought I was totally nuts — and I’m surprised he didn’t jump off the pier there and then, for he told me his friend gave him the jersey years ago, and it wore it because it was the only thing that fit him. He didn’t even know the name of the team. That was a tough conversation. But when I go to Cincy itself, or over the water to northern Kentucky, it’s a different story. I’m home. Last November, I went over for a game (against the Bucs – we won), and on that trip I was treated by many other fans as if I were a long-lost member of the extended family. But the best feeling is when my English accent and my academic identity dissolve entirely into the background and when all that’s significant is when, in a Cincy sports bar or sports store, I find myself chatting with a local about football stats and strategy. How did I come to be a Bengals fan? I don’t quite remember. It really is part and parcel of who I know myself to be. People from the UK tend to speak about choosing a football team, but deep down I feel my team chose me. I couldn’t contemplate choosing to support any other team, no matter how disappointed, angry, and miserable, the Bengals often make me feel. I’m in it, with them, for all the ups and downs. It’s ‘character building’, so they say – at least that’s what I try to tell myself when I’m shouting at the TV. Step back a moment, how did I even get in to this sport? I do, however, remember when I first got into football. That was through my best friend at secondary school – a girl from Palo Alto, a Niners fan. I watched Superbowl XXIII the day after it aired, on video tape round her house after school. But I remember already being a Bengals’ fan at the time. I already had magazine cut outs of Tim Krumrie and James Brooks taped to a school ring binder. The last minute of that game tested our friendship—due to a bloke called Montana and another called Rice—but our friendship survived, if not deepened because of it. I also recall from a year or so before then, really fancying a boy from New England. He was only at our school for a year. I was smitten, and a little bit heart broken when he left to go back. But in hindsight, it probably wouldn’t have worked out (since he was an avid Pats’ fan!). My love of the game was consolidated in 1992 when I entered and won a Channel 4 competition to go to Superbowl XXVII. To be eligible to enter I won a weekly competition that ran throughout the season, predicting the winning teams each week. My prize for the weekly competition was a Starter satin jacket of a team of my choice – there was no choice: Bengals sine qua non. (Irrespective of my bias, it was, unquestionably, the coolest Starter satin jacket out there!). Following that, at the end of the season, all weekly winners were telephoned by Channel 4 with a question, the closest correct answer to which would win the Superbowl tickets. The question was “how many TDs have been scored in Super Bowls to date”. My mind went blank, but my mathematically-astute boyfriend was on standby, and he suggested I say 129, which I did. When I tuned in to watch Mick Luckhurst, the then-presenter of Channel 4 Football, announce the winner, I was convinced I hadn’t won, because my name didn’t appear on the list of names scrolling up the screen in reverse order of answers given. I thought they had forgotten me. When my name eventually flashed up on the screen as the winner I fell off my sofa. My boyfriend and I were going to the Super Bowl (and staying away from home in a hotel in Beverly Hills)! Funnily enough we got the answer wrong. It wasn’t 129. The actual answer (from what I recall) was 128. Of course, a couple of boffins out there had anticipated this would be the question asked, so they did their research and had the correct answer up their sleeve. I was told, however, that the team at Channel 4 had reviewed the data several times to double check the correct answer – and each time they arrived at 129. The two people who said 128 complained. Because my name had already been announced on air Channel 4 felt obliged to honour me with the prize. Behind the scenes they held a tie-breaker question for the other two contestants (I don’t know what it was), and the winner (plus their guest) flew out with us to Pasadena. Another ‘funny’ issue was the fact that the competition took place before the now-familiar Terms and Conditions are announced. My boyfriend and I happened to be minors at the time, and so we had to be accompanied by a couple of (very fun) staff from Channel 4 throughout the trip. The Super Bowl blew my mind. The Cowboys thrashed the Bills. Michael Jackson played half-time. Mick Luckhurst gave us beer (perhaps I shouldn’t have mentioned that bit). And I naively spent most of my spending money on an overpriced Lotto 7 Boomer Esiason jersey at a pop-up stall. I often think that a win must feel so much sweeter to a Bengals’ fan than it does to, say, a Pats’ fan, or any other team that gets used to winning. In that respect, it wouldn’t surprise me if Bengals’ fans appreciate the highs higher than others. But there is also a dark side to being so passionate a fan, and that is learning to cope with disappointments, especially the crushing defeat of a close game. I’m known as a happy-go-lucky, chilled out person, but in the fading minutes of a close Bengals’ loss I become an unbearable lout. (In this respect, it’s probably good that I live in the sticks far from other fans!) I shout at the TV, I swear, and in the past there have been one or two times I’ve even tried my hand at bargaining with God (but, alas, as I’ve discovered, God is not a Bengals’ fan). Aside from those ugly moments, for the most part, my passion for my team expresses itself in much more positive ways. I find it helps to talk NFL football sometimes to American students who feel a bit home sick, having come to study in the UK on exchange programmes, and I occasionally use football metaphors into my University teaching. Over the years, my university office has become a Bengals’ shrine (‘Woman Cave’), and I’m quietly chuffed that I’ve managed to sneak ‘Who Dey’ into my official University email signature without people noticing or making me remove it! I often wear a jersey when I teach (if I can get away with it), and I’ve been known to wear one under my robes during procession in graduation ceremonies, and sometimes at international conferences (the next one I’ve been invited to happens to be in Pittsburgh!). Who Dey in the UK Every Day! Check out: @WhoDey­_UK for other UK Bengals fans and UK Bengals’ news. Interested in being featured in our blog series celebrating female NFL fans? Send your story along with any photos you wish to share, to liz@nflgirluk.com. Celebrating female NFL fans in the UK: Introducing Vikings fan, Rachel Poulson. Celebrating female NFL fans in the UK: Introducing San Francisco 49ers fan, Mia. 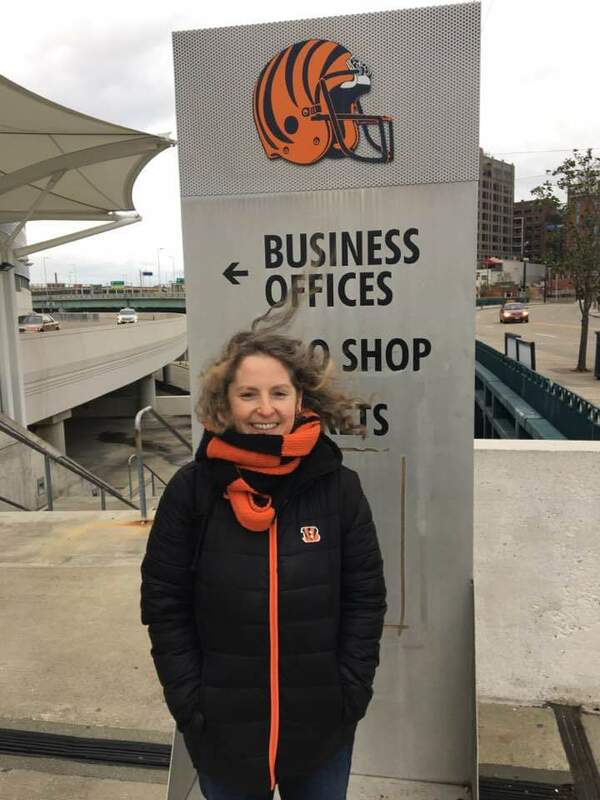 Celebrating female NFL fans in the UK: Introducing Cincinnati Bengals fan, Helen Stirling.